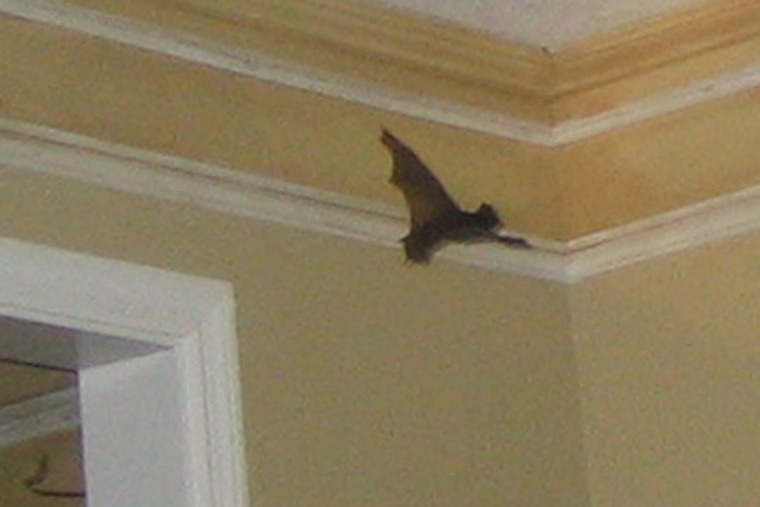 ﻿ Is it common for bats to get inside the living areas of a home? Is it common for bats to get inside the living areas of a home? Junctions where walls meet walls, attics, ceilings, roofs, etc. The reason for this is that bats are constantly on the lookout for a cool new place to set up a roost. During the spring and summer, this will likely be a maternity roost — a place where mothers go to hang out together, have their babies, and then take care of them. There is safety in numbers, as they say. Bats usually invade places that are higher up in the home or in a building — attics, the roof, etc. Every now and then, however, a bat will manage to find a little pathway somewhere that takes it away from its peers. This pathway could lead anywhere — into the deepest cavities and recesses of your walls, into a bedroom, perhaps even another well-used room in your home. This is usually met by panic from the residents, as you can expect, but this does more harm than good. A stressed-out and panicked bat will never find its way out again, no matter how many times you try to shoo it in the direction of the open window or door. If you do happen to find a bat in your house, please don't panic. That bat is probably more scared of you than you are of it, and when a bat gets panicked it will flap around, break stuff, and potentially bite. You might not feel the bite, but bats can carry and transmit the rabies virus. Carrying on from that theme, make sure that all other people and animals are out the way of your flying monster. It will be erratic, flying in all sorts of weird and wonderful directions, and despite being perfectly able to fly very well normally without bumping into things, there's a chance it will fly into your ornaments, photo frames, mirrors, and various other things along the way. It just goes to show exactly how stressed out these creatures can get when they find themselves in YOUR territory. Perhaps you should give the little guy a bit of a break? One bat in the house almost always means there is a colony in your attic or in a similar space. You will need to go looking for it, as well as the holes that led the furry mammals in, in the first place. All holes will need to be sealed, not just to prevent these bats from coming back in, but also to prevent other wild animal invaders. You can't do the sealing part until you have done the eviction part, however; that's the bit that usually proves quite tricky. There are so many laws in place to regulate the movement, eviction, killing, trapping, and even harassing of bats and bat roosts/nests, you might get yourself into trouble with the law, without even realizing you are doing anything wrong. Research beforehand is paramount. Once you have worked out the best course of action (it will change depending on the situation and time of year), you are then free to complete the cleanup part of the job, which is actually going to be the most labor-intensive. You will need to find all guano and then remove it, but you can't sweep it away because that increases the chance of the potentially deadly histoplasmosis virus airborne, free to be inhaled by you, your family, your house guests, and your pets, alongside other wild critters that may be unlucky enough to be in the area. Add a few rounds of disinfectant, bleach, antibacterial agents, and various other cleaning agents to the mix, all the while ensuring you don't mix anything to get an adverse reaction, and you might just be done … with the exception of working out how to dispose of everything in the right way. Now you know why the professionals charge for their services, right? Go back to the Bat Removal page, or learn about bats in the attic with my Bats in the Attic guide.